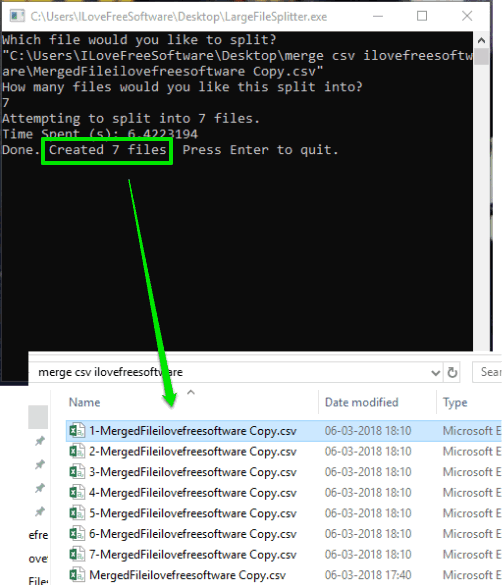 This tutorial explains how to split very large CSV files. 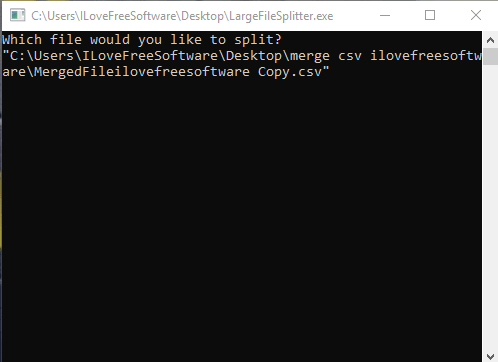 There are many free CSV file splitter software available (you can check this list) but sometimes such software don’t come in handy when we have to split a huge CSV file. Such file can contain thousands or millions of rows and columns and its size could be in GBs. In that case, you can use a free software that is especially available to handle large CSV files for splitting it. 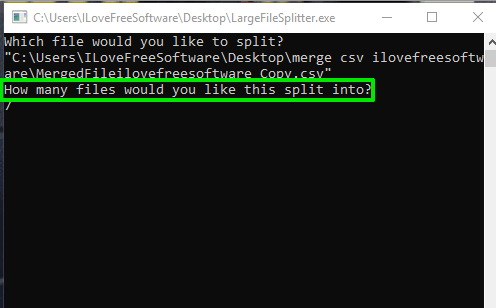 The software that I covered in this tutorial is named as “LargeFileSplitter“, and its name gives a strong hint about what this software does. This software lets you split very large CSV files in seconds but only one file can be split at once. During my testing, I was able to convert a 250 MB CSV file (having thousands of rows and columns) into 7 different CSV files within 10 seconds. So, I can say the software is handy. Note: .NET Framework 4.5 must be installed to use this software. In the screenshot above, you can see the interface of this software where I split a large CSV file and output files are also visible. How To Split Very Large CSV Files? Step 1: Download the EXE of this software. You can download that EXE with the help of link given at the end of this tutorial. Step 2: Launch that EXE and its command prompt like interface will open. Don’t worry you don’t have to execute any command. Step 3: Drag and drop a CSV file on its interface that you want to split. After dropping the file, press Enter. Step 4: Now it will prompt you to set how many files you want to create. You can enter any number like 5, 10, 15, etc. Add a value and press Enter. The software will start splitting the input CSV file and create the output CSV files. This whole process may take seconds to minutes depending on the total number of rows and columns and size of input CSV file. Once the output files are ready, you can close its interface. I find this software very interesting and helpful to split very large CSV files. Only one CSV file at a time can be split but the good thing is splitting process is fast and therefore the software is worthy.